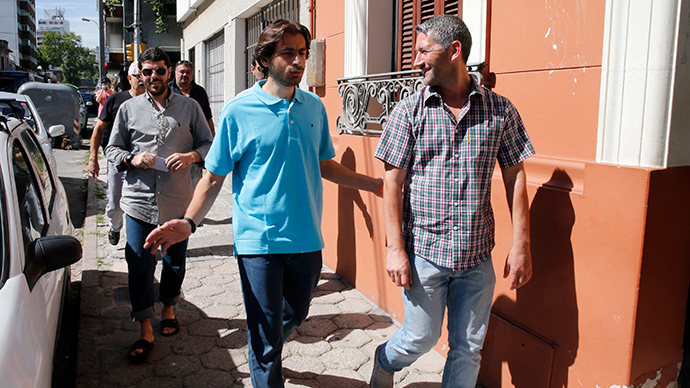 Six former US detainees, who have never been charged, are beginning their new life as refugees in Uruguay. They arrived on Sunday and have given their first comments to the press to say they are happy to be there. The six include four Syrians, a Palestinian and a Tunisian. Although they were cleared for release in 2009, the US was not able to discharge them until Uruguayan President Jose Mujica offered to take them. One of the Syrians, 32 year old Ali al-Shaaban, has been held for more than a decade in the Guantanamo prison in Cuba, after he was arrested in Pakistan following the 9/11 attacks. “We are happy to be here,” he has told the Guardian by phone in his first interview since arriving in Uruguay. One of the other detainees, Abedlhadi Omar Faraj, issued a letter through his New York lawyer on Monday thanking Uruguay for their decision. “Were it not for Uruguay, I would still be in the black hole in Cuba today. It’s difficult for me to express how grateful I am for the immense trust that you, the Uruguayan people, placed in me and the other prisoners when you opened the doors of your country to us,” read the letter. “They got hugs from Uruguayan officials, friendly waves and thumbs up from the other patients at the hospital, the Uruguayan reception team even brought bathing suits for them,” Michael Bone, the Boston lawyer who helped secure Shaaban’s release, told the Guardian. One of the refuges, Abu Wa’el Dhiab, arrived in Montevideo in very poor shape, having been on hunger strike for seven years. His lawyer Cori Crider said Dhiab never thought he’d be released. “It’s going to take some time for him to come down off his hunger strike, he’s six foot five and only weighs about 148 pounds, he’s extremely thin, in pain, emaciated and still confined to a wheelchair,” said Crider, as quoted by the Guardian. Jose Mujica, the 79-year old Uruguayan president said his decision was a “humanitarian gesture.” He himself spent 13 years in prison and two of those in solitary confinement, incarcerated by Uruguay’s military dictatorship. However, he has voted against trials for crimes committed when the country was under military rule.